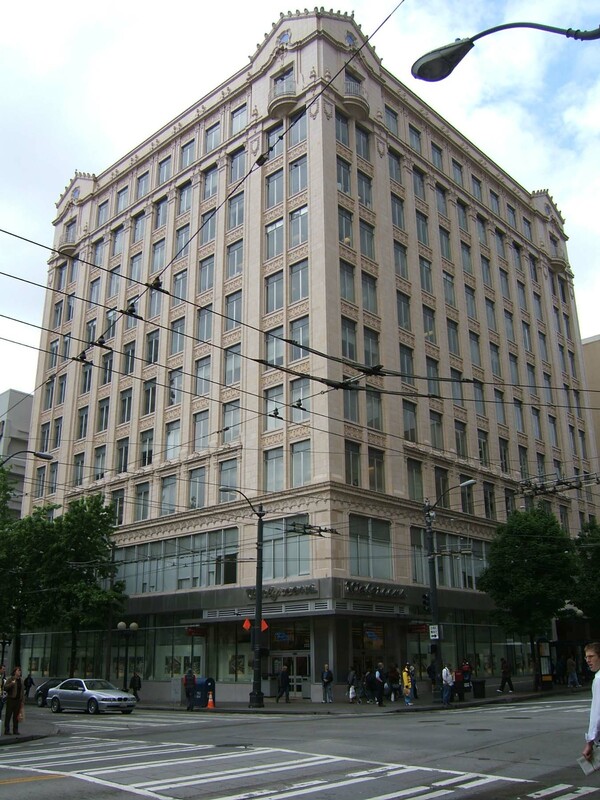 Prominently located at the NW corner of Third Avenue and Pike Street, this ten-story office building originally included several storefront retail shops and now houses a large chain store with the upper floor levels used for commercial/office purposes. It measures 111’ x 116’ and exhibits a three-part vertical block façade composition and architectural ornament using Spanish Eclectic, Baroque and Rococo derived decorative schemes. The steel and reinforced concrete structure includes a foundation and basement and is entirely clad with cream-color glazed terra cotta. The two principal facades are nearly identical in composition, each with prominent two-story base, seven-story shaft and highly ornamented one-story building cap. Each of the facades is divided vertically above the base into (two-window wide) corner bays and multiple central bays (one-window wide) that are divided by interstitial piers. The storefront portion of the two-story base including the original two-story building entry portal (at the northernmost bay) has been entirely remodeled and modernized and does not include any historic building fabric/features. The second floor level portion of the base is intact with the exception of the windows, which are a modern aluminum product and very dissimilar to the heavy tripartite sash with transoms that originally distinguished this floor level. The fenestration pattern at this floor level is unique with an expansive window opening framed by terra cotta cladding that extends the full width of the central bay section. The window openings are trimmed in terra cotta and the base is surmounted by an intermediate cornice with an ornate corbel table. At the shaft, narrow piers separate the central window bays and rise uninterrupted for seven floors to composite capitals. Recessed spandrels mark each floor level and are decorated with spiral and floral motifs applied over rose-color terra cotta tiles. The major piers are capped by ornate shield ornament. All of the original pivoting wooden windows with transoms have been replaced with a very dissimilar modern aluminum product. The building is capped at the tenth floor by a highly decorated tenth floor level and parapet level design. Each of the wider corner bays is terminated at the roofline by a gabled parapet with ornate terra cotta cresting. At the tenth floor level, each of the wider corner bays includes a single window with a small projecting round balcony and decorative iron railing. The balconies align with a decorated intermediate cornice that serves to accentuate a band of windows with ornate surrounds at the central bay of each elevation. Polychromatic ornament and mouldings surmount the windows with curvilinear Rococo mouldings and medallions at the wide corner bays. All of the original multi-pane 8/8 double hung sash that further distinguished the cap have been replaced with a very dissimilar modern aluminum product. As noted above extensive alterations have been made to the entire storefront level and all of the original windows have been removed and replaced with very dissimilar aluminum windows. There do not appear to be any intact or architecturally significant interior building features, finishes or public spaces.